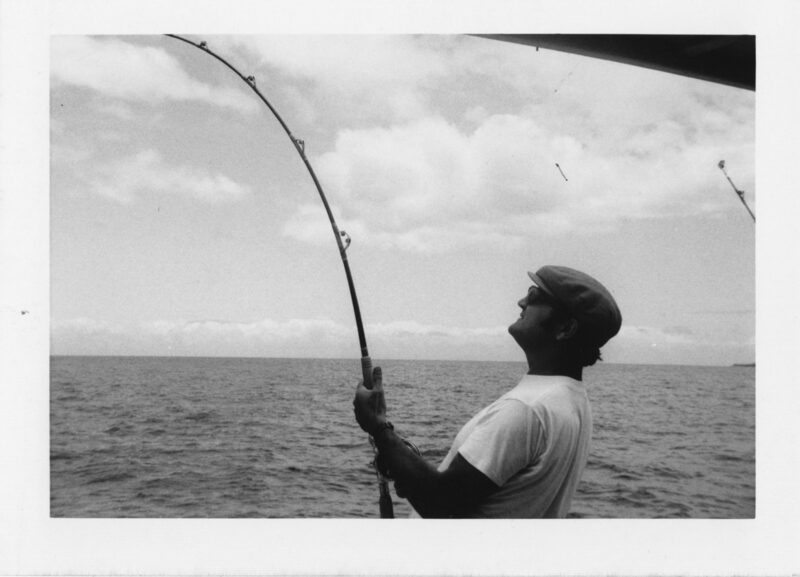 Fishing was everything to my father. It wasn’t the only thing — he was a math teacher, Dean of Studies, a college counselor and the head of the Lower and Middle schools at the Hawaii Preparatory Academy. He loved rowing and took Iolani’s crew to the 1964 Olympic trials. He was the first person in his family to go to college, at age 16, and he went on to get his master’s degree from Wesleyan University in Middletown, Connecticut. He was a photographer, an erstwhile TV personality, a whiz at Trivial Pursuit, a model in the September 1960 issue of GQ, and a gifted storyteller. But no matter what else he was doing, he was always fishing in his mind. Sunday was Column Day. 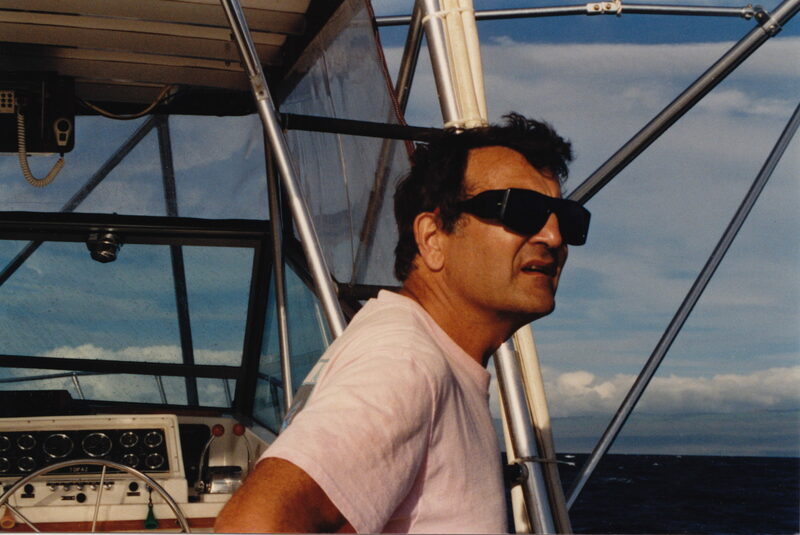 He started writing before I could walk, and crafted thousands of articles on fishing in Hawaii for newspapers, websites and magazines from Australia to Italy. He was a two-time winner of the prestigious Outdoor Writers Association of America Award, and his books, Modern Hawaiian Gamefishing, Fishing Hawaii Offshore, and the Fishing Hawaii Style series are essential and engaging, reading. 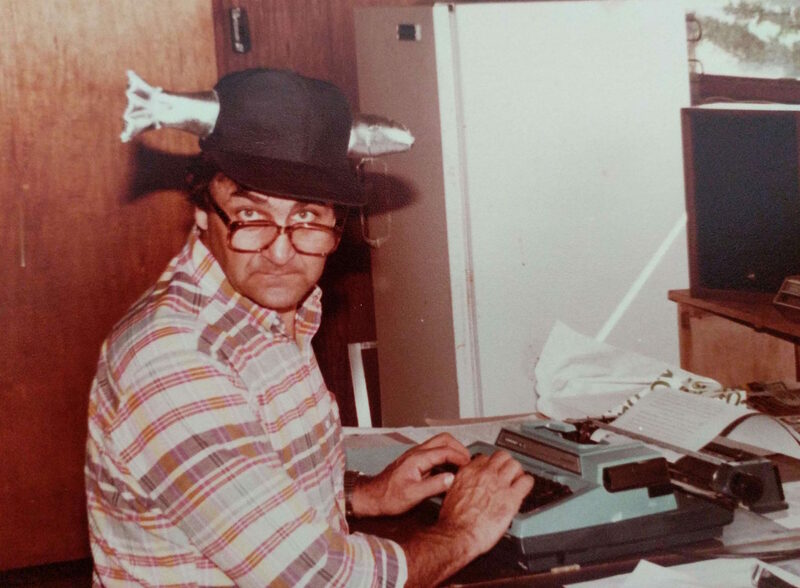 But his heart was here, in his monthly columns for Hawaii Fishing News and in this weekly roundup of the best, and strangest and most exciting fishing stories, The Kona Fishing Chronicles, which started running before there were computers (let alone internet) in West Hawaii Today. As a kid, dad used to bike down to the Delaware River with his spinning rod, where he caught striped bass in the shallow, fast-moving water beneath the “Trenton Makes, the World Takes” sign on the railroad bridge just blocks from his home. 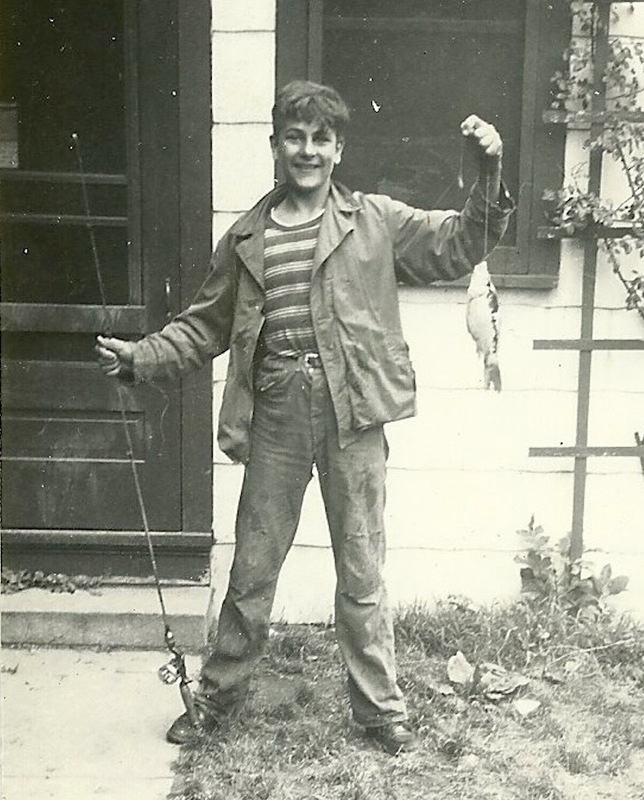 Sometimes, in his stories, he was alone, escaping work in his father’s sweltering shoe shop; other times he and his father were together, catching buckets of bluefish, which were the reason — so he claimed — that he could never stand to eat fish. 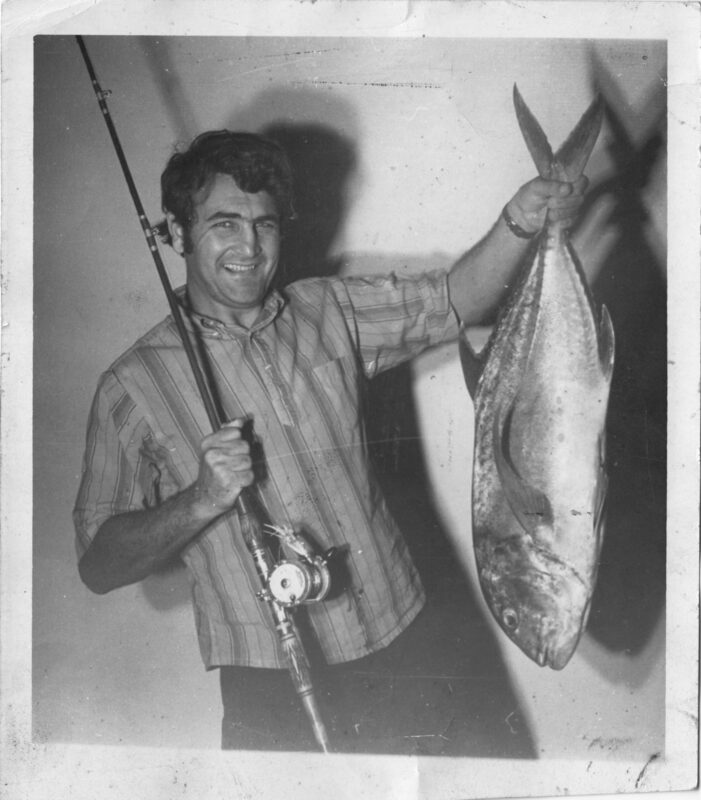 He was a freshwater fisherman when he came to Hawaii in the early ‘60s — a fly fisherman whose casting was as regular and soaring as music. He learned to fish Hawaiian style in Molokai from my Japanese grandfather. Every August, our extended family would land at the tiny airport, jump into the two trucks my grandfather’s local cronies left for us (keys in the ignition, windows rolled down, my cousin Chris reminds me) and drive to the Quonset hut where we lived and fished off a flat bottom boat for papio, or slipped on tabis to wade offshore for oi’o longer than most of us kids. Fishing was family style in those days. Back in Waimea, we had a 16-foot Glasspar, the Shiranti, a boat so small that, once he set the steering and went to the back to put out the lines, dad could simply lean in one direction or the other to turn the boat. We kids were his crew, and at ages 5, 6 and 7, we spent most of our time jammed up in the only seat with him, hiding from the spray. It was an arrangement he would sometimes regret, especially the time when we were pretty far past the windline at Mahukona, and the three of us threw up a spectacular rainbow of the morning’s Fruit Loops into his lap. We fished by ear: he knew our speed by how the engines sounded. We fished by eye: lining up cinder cones and outcroppings with water tanks and stands of trees to find the never-fail school of ‘opelu. We were “run up and down the coastline” fishermen, who made a point of hitting the 1 o’clock ono bite at Black Point, and more than once we had two singing reels on the strike of the clock. For years, we never got skunked because dad always had a trick up his sleeve. And he had flags, too. We kids insisted. Even if all we caught was a kawakawa, we ran our flags up the outriggers and did a wide, fast, victory lap in the harbor before we went home. Although he didn’t lack for company, dad did sometimes go out alone. One of his favorite stories was the one about the quadruple ono strike. If I were a better storyteller, or perhaps a better daughter, I could tell you where he was exactly (my sons think between Black Point and Mahukona), and what he was trolling (Kai would bet he had his favorite red and black leadhead right down the middle). I can’t tell you what the weather was like, and which line went first. But what I can tell you is that he cut his hand pulling in the first ono and was bleeding all over the deck, with three more on. So he grabbed a towel (or was it a rag?) and wrapped it around his palm and tied it so he could get the other three into the boat. You could find him on the Kailua pier by the King Kam every August during the Hawaii International Billfish Tournament where the marlin were being weighed. You could find him, just as easily, hanging out at Kawaihae, waiting for Flash to come in on his 14-foot skiff. He wanted to know what they caught, and he was full of questions: what, where, when, on which lure? That is the stuff of his column, for sure, but he wasn’t gathering stories so he had something to write about. Just the opposite. He wrote because there were so many stories to tell. 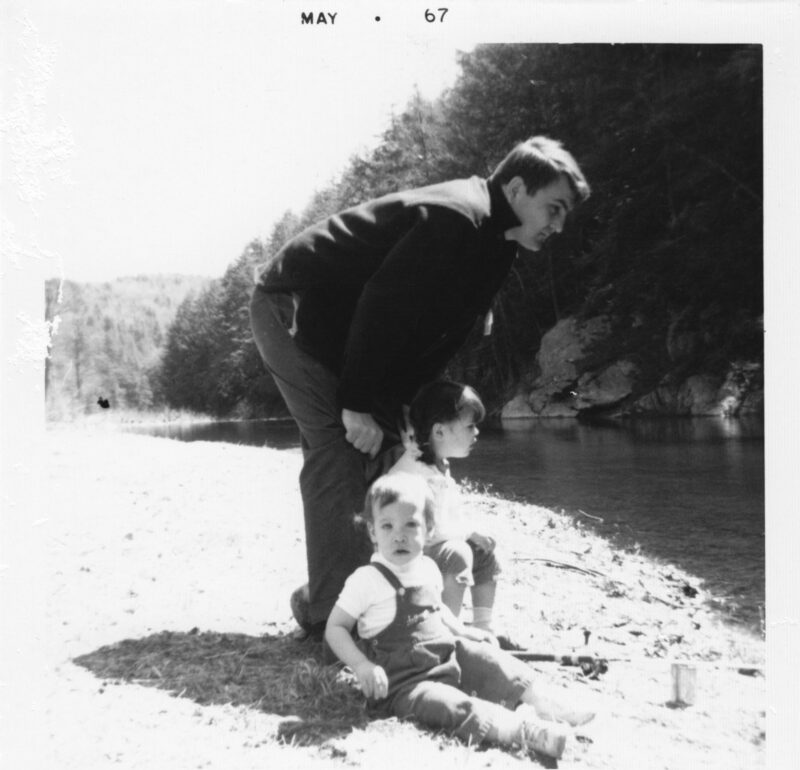 My father is known as an expert, a mentor, an educator, but I think of him as a student. 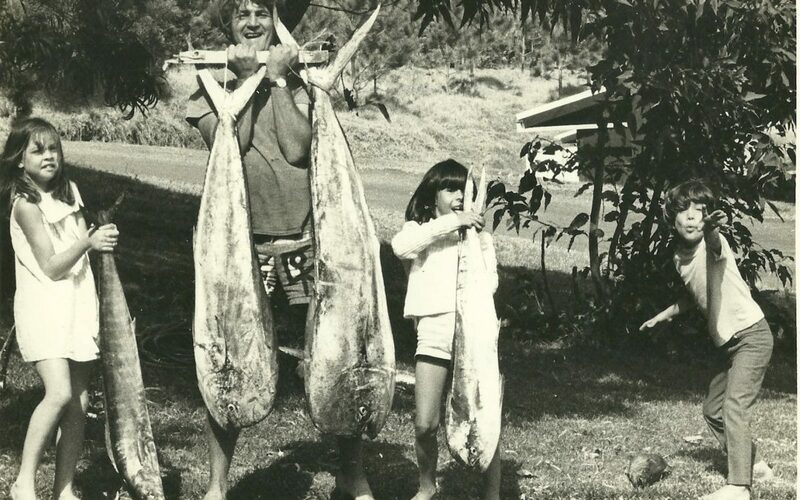 In 1969, we had the good fortune of moving in next door to Zander Budge, who was running the Spooky Luki out of Kawaihae. Zander taught dad not only big game trolling, but also how to make lures. Dad was a quick study. He absorbed anything anyone could teach him, and then tried to add his own spin. When he came to visit me in New York, he dragged me to Canal Street Plastics for flashy inserts and unusual skirt materials. The house was – and still is – littered with lures, from polished to gummy, and you could often find him wandering around sharpening hooks (which he had the habit of sticking his fingers with later). As dad got older and we left home, he stopped taking the boat out as often. Even when the next generation of Rizzutos hit the water with him — including my son Kalei who insists that he pulled in the first and only black marlin ever caught on the Rizzuto Maru (he was 2), and my son Kai, who did in fact pull in a grander on the Ihu Nui when he was 16 (my brother says dad “just would not shut up about that!”) — you might believe that he had mostly stopped fishing. But you would be wrong. Because, every Sunday, he was out fishing with all of you. Sundays often found my father wandering back and forth between his office and the living room, stopping to gaze out toward to ocean. Some weeks, he’d been doing interviews and gathering stories for days already and now he was writing them in his mind. Other times, he was waiting for the Charter Desk to call. You never failed him, and in your adventures, he found his own. Storytellers live in their heads, which is where all good fishing tales grow, so it was easy for him to join you. He was there when you pulled out of the harbor. When the fish hit. He knows what happened when it spotted the boat. It doesn’t matter if you were in a kayak or a charter boat. Whether you caught a record, a wandering Spanish mackerel, or a baby sailfish the size of your palm. He could find you a cute title, a who-dunnit ending, an excuse to quote Emily Dickinson (“Hope is a thing with feathers”) because he was a fisherman, too. I don’t think any of us understood just how sick dad was until he couldn’t write his column on Sunday, two weeks ago, which was doubly-upsetting because there was a tournament he had promised to cover and he hated to break his word. He passed the following week, in the early hours of Sunday morning. It seemed fitting that his spirit chose Column Day to take off and go forever fishing with you. This article first appeared in the West Hawaii Today, to announce my father’s passing and his celebration of life. Reposting here for Father’s Day.